What is Enterprise Architecture Blueprint meaning? Many organizations today make use of Architecture Blueprints. A blueprint plays an important in strategic changes. But what exactly does the definition blueprint consists of? And what is a blueprint? Both questions are answered here on this page. The definition of an Enterprise Architecture Blueprint, compliant to Dragon1, is: A diagram, schema or visualization that gives an architect or engineer overview of all important concepts, the logical elements and the physical components, their attributes and their interrelationships through-out the enterprise with meaningful information. 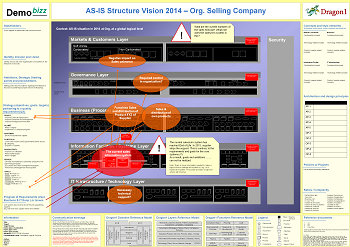 An Enterprise Architecture Blueprint is often used to manage risks in strategic changes. The Enterprise Architecture Blueprint helps to pinpoint issues and concerns and scope, design and realize solutions or changes of the situation within the enterprise. A blueprint is a diagram that often shows layers with groupings of components in elements and groupings of elements in concepts. Compared to an Enterprise Architecture Blueprint, an enterprise architecture landscape diagram would be more like a management overview than an engineering overview. Do you want to create Blueprints yourself? On the Dragon1 Platform, a lot of free templates are available.